"Did you think your song and dance and your superstition would help you, Eli? I am the Third Revelation! I am who the Lord has chosen!" For my money, the best films tell a story through every means available. That is to say, when all of the elements—acting, direction, cinematography and music—all gel into a cohesive whole and advance the story and characters in their own way. Paul Thomas Anderson�s There Will Be Blood is the best example of this in recent years. Much has been written about how this film—a study of greed, competition and evil—which is, at its core, an epic about the dehumanization of the human soul. And it is. This is a well-layered, subtle and endlessly compelling epic which never feels it necessary to hammer its point home; in fact, there's been considerable debate as to the director's ultimate point and purpose. Some have interpreted it as a thinly veiled attack on the Bush regime while others have hailed it as an intimate and disturbing character study about one man�s alienating madness. While I'm not going to spend too much time trying to mine the depths of Anderson�s themes, I would stress that the mark of an effective film is one that keeps people talking about it long after it's over. In this capacity, There Will Be Blood is a success. The film opens with a beautiful shot of a mountain range, but not a moment passes before Johnny Greenwood's ominous musical score, a haunting collage of string instruments, washes over the frame and sets the viewer on the edge of their seat. We're not sure what's about to happen, but the music loudly proclaims that it's not going to be good. The title is promising blood, after all. And consider the way in which we're introduced to our main character. Sure, we see Daniel Day Lewis within the first two minutes of the film, but Anderson doesn't bother to devote any time to this grungy, faceless schlep of a silver miner. It's not until this guy accidentally discovers a geyser of petroleum that Anderson allows us introduction to Lewis' Daniel Plainview. Backed by the wealth of his prosperous oil trade, Plainview is a charming, calculating businessman from the get go—it's clear from his first interaction with an assembly of desperate villagers that he's in it to win. So much has been written about the Lewis' brilliant performance and I of course agree, so instead I'll focus on the lavish and inspired cinematography by Robert Elswit, which often is as captivating as the charismatic leading man of the production. Several scenes consist of one uninterrupted shot, which only help to draw the viewer deeper into the proceedings, from a frantic tracking shot featuring a frantic Daniel rushing to his son's aide during a pump accident to the perfectly framed and disturbing final shot that tells us so much more about the character's psyche than any line of narration or dialogue ever could. People may debate the finer points of There Will Be Blood, but the craft with which this story is spun is as close to perfection as any recent film. This isn't so much a movie as it is a literary experience captured on film. There's a bit of hypocrisy there, I realize, but Anderson doesn't feel obligated to tell his story within the strict confines of traditional narrative. He allows his world and its inhabitants to breathe, revealing some fascinating and frightening character asides as a result. There Will Be Blood is a far richer experience than usual because of this and by the time we reach the conclusion, we are left battered and emotionally exhausted for having visited this very real place. Image Transfer Review: There Will Be Blood makes its debut on Paramount Blu-ray in a transfer that manages to be as brilliant as the film. The stark white sunny skies of California are absolutely brilliant, while the night time scenes offer deep, solid blacks and rich textures (particularly on the billows of smoke). With the exception of fleeting traces of edge enhancement, this is a stunning image and would make excellent reference material for any high sef. skeptic out there. I read one criticism concerning this release chiding Paramount for applying DNR to the image. It's ridiculous to even think it the case and I mention it only so I can refute the claim. This Paramount Blu-Ray doesn't try to hide the actual film grain (which isn't terribly prevalent to begin with) and reproduces flesh tones with the utmost accuracy. Not to worry, there isn't a hint of orange skin on this release. Audio Transfer Review: The 5.1 TrueHD track truly satisfies. Johnny Greenwood's memorable score is reproduced in crystal clarity and the dialog renders each syllable with the utmost clarity. Even if your rear surround speakers aren't going to get the strictest workout with this title, the rear channels help immerse the viewer in the film with a constant barrage of surround noises which never distract from the front speakers. This mix effectively preserves the sound design of the film which I was lucky enough to see twice during its theatrical run. Extras Review: Paramount's collection of supplemental material sadly doesn't measure up to the stunning audio/video presentation here. The majority of bonus material doesn't amount to much more than some deleted scenes. Though, to be fair, they are interesting and well worth looking at. There's a 27-minute silent film called The Story of Petroleum, which serves as an educational curiosity piece for those fascinated with the early 1900s. An included 15-minute featurette is actually a collection of stills juxtaposed with images from the film to illustrate the precise accuracy of the production. It's a compelling little production that served to heighten my appreciation of the film. The deleted scenes and dailies are neat, too (and in HD), but one gets a sense that there's more that we're not seeing. Perhaps on another release down the line? One theatrical trailer and one teaser ... both presented in HD. 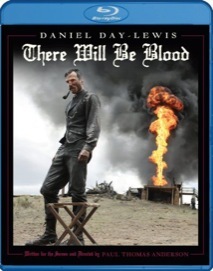 Like most critical darlings, There Will Be Blood is certainly not a film for all tastes. The detached presentation of its subject matter will undoubtedly alienate some viewers while others will find themselves chewing on the proverbial fat in this unique character study for days and days after viewing. Paramount's Blu-ray disc provides a near-flawless presentation for admirers to enjoy the breathtaking visuals and the grittiness of its performances.